Having snow storm warning in our area for two days keep us inside yesterday, but today after seeing all this snow outside we went sleighing because the weather and amount of snow let us to enjoy this frosty winter day. Anyway, after coming back home everyone wanted something warm and sweet, so the apple crumble I made last night was the perfect choice for this. The recipe is gluten, dairy, refined sugar free. It’s vegan and easy to make. I guess in summer you can try to make it with berries, but my favorite one is still with the apples. Preheat the oven to 375F . Make the Apple Filling. 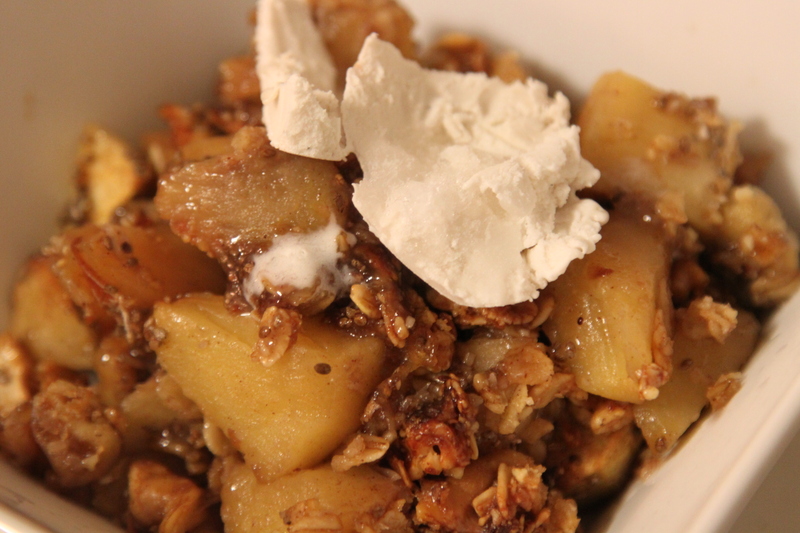 Place the apple in a large bowl and sprinkle the arrowroot powder on top. Toss until combined. 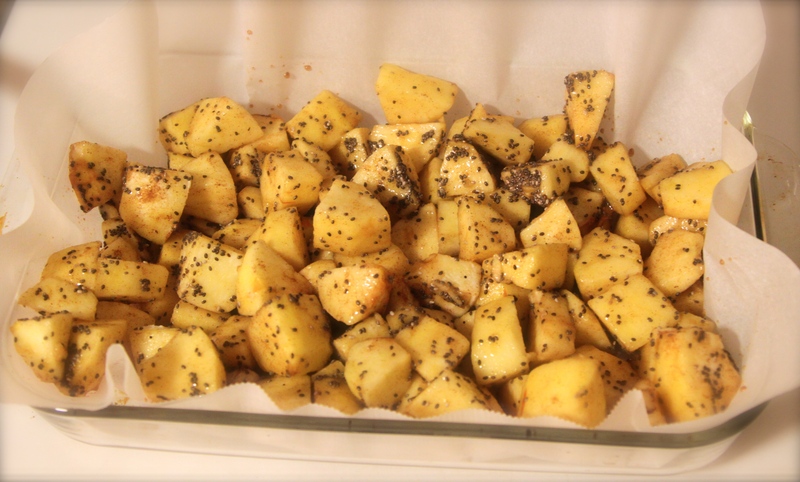 Stir in the sugar, chia seeds and cinnamon. Add the lemon juice. 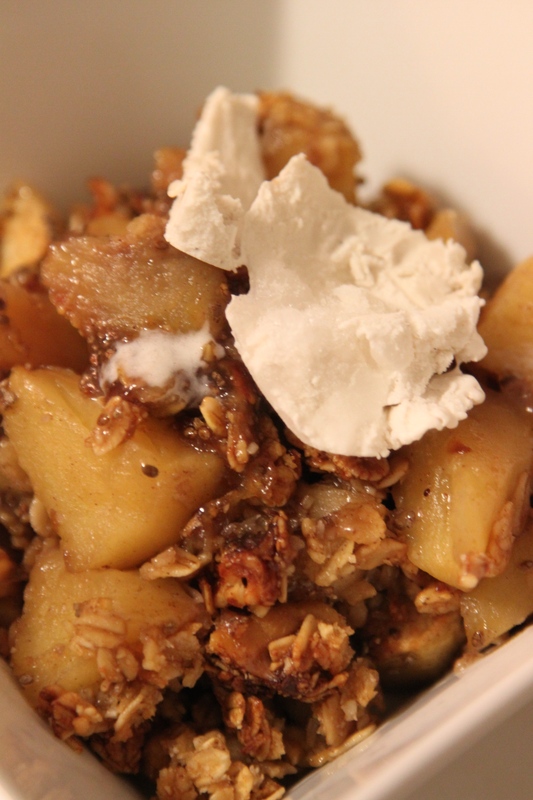 Pour the apple mixture into the prepared dish and smooth it out evenly. Make the topping. In a large bowl stir together the oats, walnuts, almond flour, maple syrup, melted coconut oil, shredded coconut, cinnamon until thoroughly mixed. 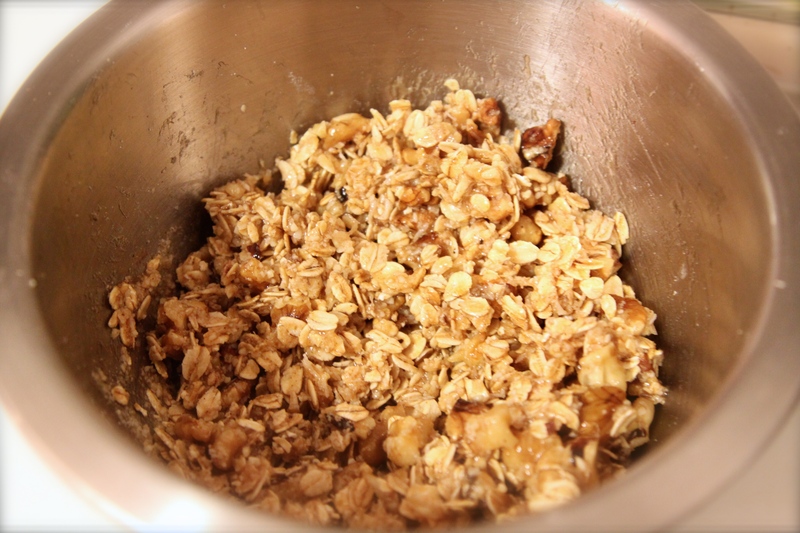 Sprinkle the oat mixture all over the apple mixture in an even layer. Cover the dish with foil and poke a couple of air holes in the foil. 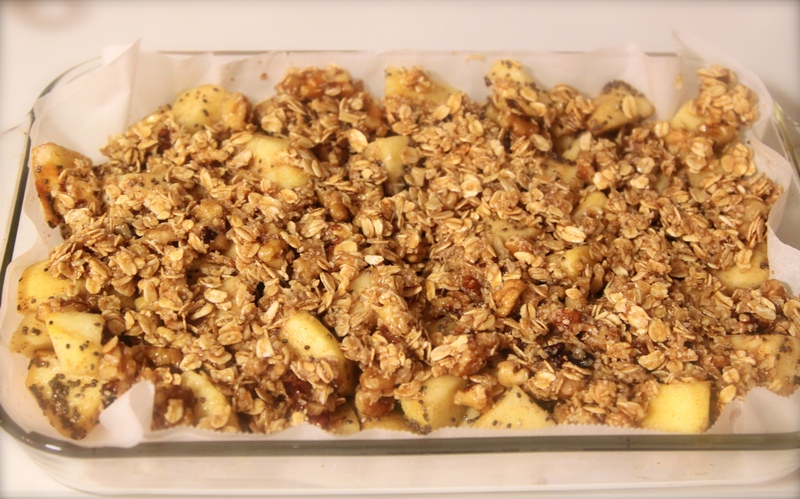 Bake for 35-45 minutes, until the apples are just fork-tender. Uncover the dish and bake for 10 to 15 minutes more, until the topping is golden and fragrant. Serve with dairy-free ice cream or whipped coconut cream. It’s healthy enough for breakfast the next day, too. 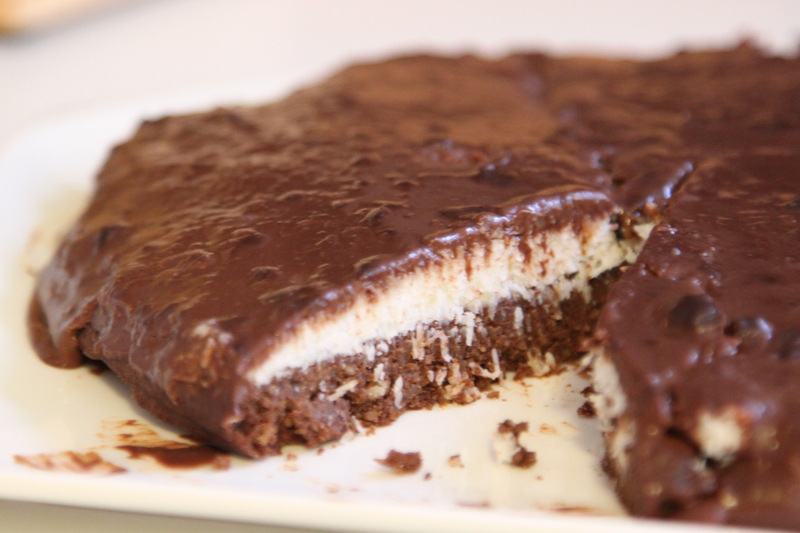 Chocolate and Coconut combination. 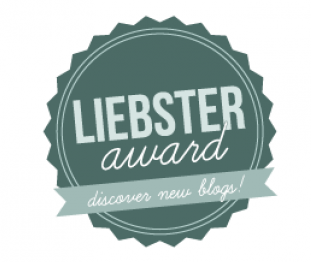 What can be better? Especially if you combine them in the healthy version of cake. This is the perfect recipe for special occasions, holidays, birthdays etc. I made it last weekend after spending few days instead because Sophia has been sick for a week already. So to make myself busy and everybody else happy I made this delicious, chocolate, guilty free cake. Gluten, dairy free with the vegan option( replace eggs with the flaxseed eggs). 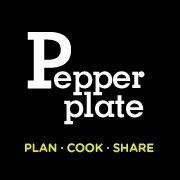 Prepare your pan by greasing the bottom and sides of an 8-inch removable bottom pan with coconut oil, then cut a piece of parchment paper and place it on the bottom of the pan. Mix together the almond flour, cacao powder, coconut sugar and salt. In a separate bowl whisk together the eggs, coconut oil, coconut milk and vanilla extract. spread batter evenly in the pan and bake at 350°F until a toothpick inserted into the center comes out clean, approximately 17 minutes. Set pan over a wire rack to allow cake to cool. Slowly melt the dark chocolate in a bowl over simmering water (double boiler). 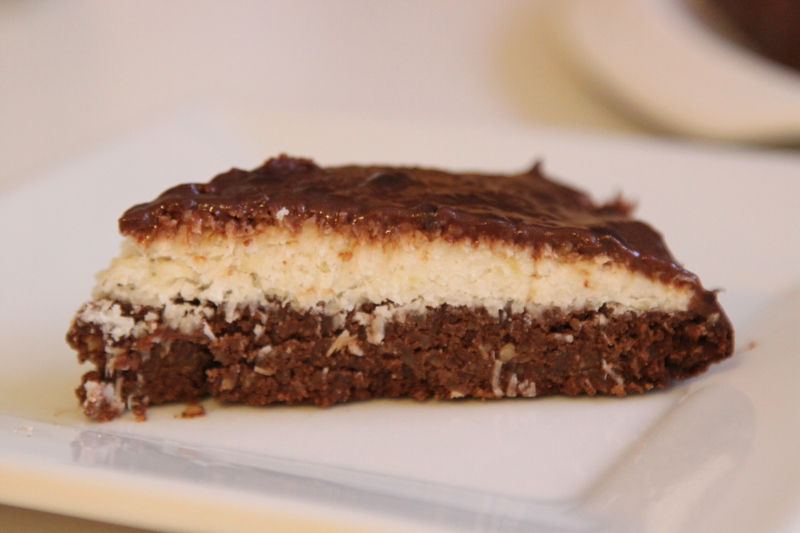 Once chocolate is melted, stir in the coconut milk and mix until the glaze is smooth and shiny. Pour glaze over the top of the cake. Refrigerate for about 2 hours or until the glaze is set. Tastes the best the next day. Is Grape Seed Oil Good For You? I used to use the grape seed oil in my recipes before. Every time when something “healthy” comes out on the market you want to substitute it with something that sounds not too healthy. This is what happened with the Grape seed oil. Few years ago you could find the information that it’s good for you, it’s better than the other vegetable oils, it has a lot of vitamin E etc. By the way, you can still find those articles these days. But the more you learn, the more knowledge you get about this or that product which turn out not healthy after all. Grape Seed Oil is processed from the seeds of grapes, which are formed as a by-product of wine making. For thousands of years, wine manufacturers have been left with tons of this useless by-product, grape seeds. Due to modern technological advances, they are now able to extract the oil from the seeds, something that wasn’t possible a hundred years ago. The oils are usually extracted in factories using an industrial process. It involves high heat and various chemicals, which includes the toxic solvent hexane. The “healthier” types of seed- and vegetable oils are “cold pressed” or “expeller pressed” – this is a much more natural way to extract the oil from the seeds. If your oil doesn’t explicitly state how it is processed, then you should assume that it was extracted using chemicals like hexane. Grape seed oil is extracted from grape seeds, a by-product of wine making. This process usually involves various chemicals, including the toxic solvent hexane. The health claims for grape seed oil are based on the supposedly high amounts of nutrients, antioxidants and polyunsaturated fats. But here’s a newsflash… most of the nutrients and antioxidants (including the proanthocyanidins) from grape seeds are not present in the oil. After it has gone through the intense chemical extraction process, most of the good stuff has been filtered out. The only nutrient left in there in any significant amount is Vitamin E. A tablespoon contains 3.9 mg of Vitamin E. However, calorie for calorie, grape seed oil is NOT an impressive source of Vitamin E. Other much better sources include nuts, spinach and various others, these foods also contain a ton of other beneficial nutrients instead of just Vitamin E alone. One of the claims is true though: grape seed oil is very high in polyunsaturated fats. 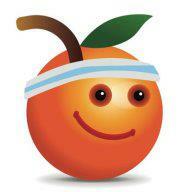 However, it is important to keep in mind that there are two main kinds of polyunsaturated fats: Omega-3s and Omega-6s. We need to get these two types in a certain balance in order to maintain optimal health. Most people are eating too few Omega-3s and way too many Omega-6s (7). Many studies show that too many Omega-6s lead to poor health and disease. As it turns out, grape seed oil contains mostly Omega-6 fatty acids, the bad kind. In several cases, grape seed oil has also been found to contain harmful levels of Polycyclic Aromatic Hydrocarbons (PAHs) – substances that are known carcinogens in animals. Really, there is nothing positive to be said about grape seed oil. 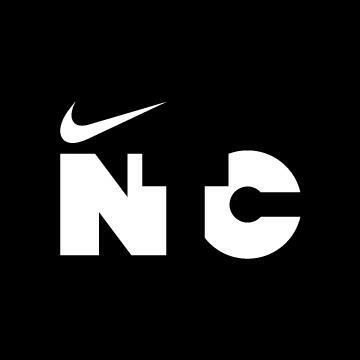 It is bad news all around. 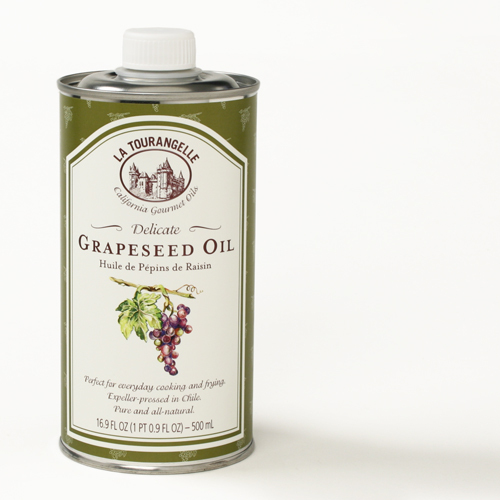 Grape seed oil has a high smoke point. For this reason, it is advertised as a good choice for high heat cooking like frying. This is based on a huge misunderstanding. The smoke point of an oil is NOT the determinant of whether it should be used for cooking or not. The number of double bonds in the fatty acid molecules is much more important. Because grape seed oil is so incredibly high in polyunsaturated fats, it really is one of the worst oils you could possibly use for cooking. The healthiest cooking oils are those that contain mostly saturated fats (like butter and coconut oil), because they don’t have double bonds and are therefore less likely to react with oxygen when heated. 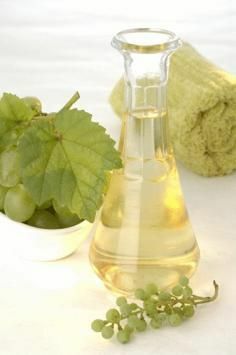 Grape seed oil isn’t all bad… there are a lot of people who claim that it is good for moisturizing hair and skin. It is also used in massage and aromatherapy. For this reason, it may have some topical benefits. But really… this oil should NOT be eaten. There is nothing healthy about it. What’s in my Mommy Bag? It’s been a while since my daughter was a baby and the inside of my diaper bag changed a few times. Sophia is 3 now, and my ‘diaper bag’ calls ‘mommy bag’ now, because first of all there is no diapers in our life for at least one year already. The traditional diaper bag changed to the regular woman purse, but comfortable enough to fit all the kid’s stuff in it. I am really happy to have some good looking purse, not just the huge diaper bag full of diapers, pacifier, toys, baby bottles etc. 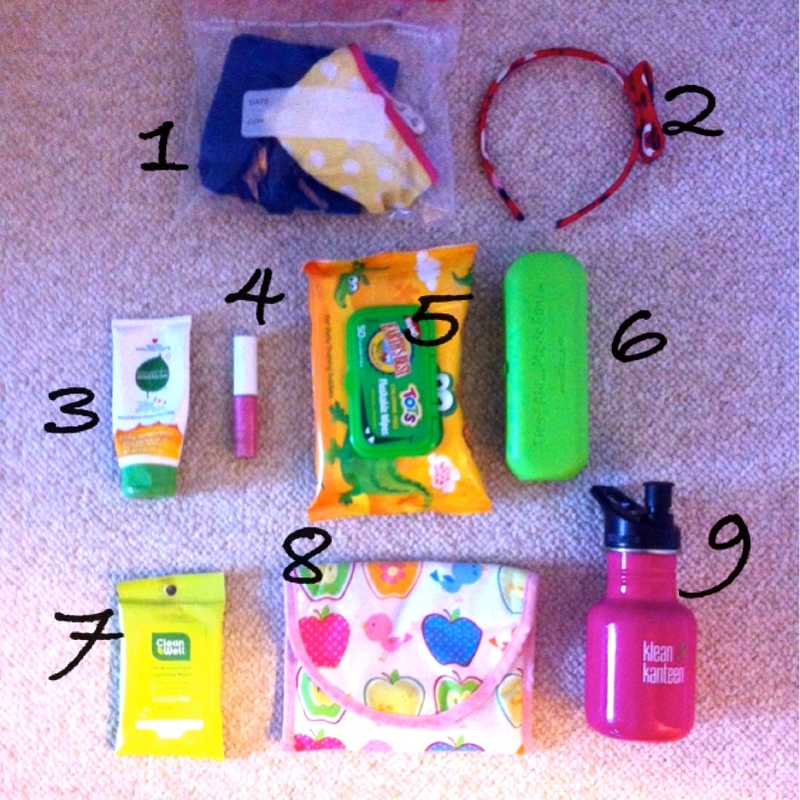 My idea is to share the inside of my ‘mommy bag’, the most important things that I usually have with me when we are out of house. Sometimes the things change, but this is top 9, what I always have. 1. Rule number 1: never leave the house with no extra set of changing clothes for your kid!!!! The set of changing clothes. It’s always in my bag and changes by season. Usually it’s a pair of leggings or tights, underwear and a long or short sleeves shirt. Holiday Bloom Headband by Polarn O. Pyret. This is the only one headband that fits my daughter’s head, doesn’t come off and is well made. All the girls love hair accessories, and I always have some headbands or bows in my bag. I tried different kinds of sunscreen lotions for my daughter but this one works the best so far. Smooth on this gentle, hypo-allergenic lotion for baby-safe, broad-spectrum (UVA and UVB) protection that’s good for the whole family. The water-resistant SPF 30 formula features non-absorbing mineral sun filters that stay on the skin’s surface to defend against harmful rays. Contains no chemical sunscreens, parabens, gluten or PABA. It doesn’t have any smell. ( I hate the smell of the regular sunscreen lotion). It’s not greasy and totally rubbed in. Lipgloss is my “musthave” piece of make up every day. If I don’t have time to put my make up on in the morning at least, I can make my lips look fresh and pretty. Cherry Oil Lip Gloss is a full color, lip conditioning gloss with a non-sticky texture that softens and cares for lips and provides a high-shine finish. Cherry Oil hydrates the lips while vitamins E and C offer antioxidant benefits. It doesn’t have any harmful ingredients and takes care of your lips making them soft and smooth. Earth’s Best TOTS Chlorine Free: Flushable Wipes: Chlorine-free, Natural aloe vera and vitamin E formula, Makes potty training easy and better for the enviornment, Hypoallergenic, Unscented, Alcohol-free, 75% less packaging than a plastic tub, Flushable mess-free! 50 wipes. We started using them when Sophia was in the process of potty training but these wipes are the best wipes for the little kids on the market, so we use them all the time now. 6. First Aid Kit for Kids. This kit is something every mom should have. It’s not so much that the products included (cute bandaids, a few antiseptic wipes, some antibiotic ointment, a little gauze and some bigger bandages for skinned knees) are fantastic – they’re just run-of-the mill stuff – but having a handy portable kit like this that you can easily re-fill with some additional antiseptic wipes (a need) and extra bandaids in additional sizes can be a lifesaver when you’re out and about and the unexpected happens. Cleanwell All Natural Hand Sanitizing Wipes help to get rid of germs and dirt easily. Great for on-the-go; open, remove wipe and rub over hands. Cleanwell products are based on a patented formulation of natural thyme oil that kills germs. CleanWell products do not contain alcohol, triclosan, or benzalkonium chloride. This natural formulation is safe for kids and great for sensitive skin. Reduce, Reuse and ReSnackIt. ReSnackIt reusable snack and sandwich bags are giving families the chance to dramatically reduce the amount of non-recyclable trash they produce each week. ReSnackIt is made with 100% cotton and an undyed nylon lining that contains no lead, no vinyl (PVC), no phthalates and no BPA. They have a folder over design that is snugly secured by hook and loop closure keeping contents and freshness inside. ReSnackIt is perfect for your on the go eats and an easy-to-use accessory for little fingers. Moms love being able to wash ReSnackIt reusable bags in the washing machine and dryer; Kids and adults love the cool designs. This one is not the best snack bag, but we still use it a lot. Klean Kid Kanteen 12oz. with Sport Cup 2.0 Every new parent wants to make sure their baby’s environment is as healthy as possible. Klean Kanteen can help with that. It’s BPA-free polypropylene and integrates seamlessly with our 12oz Klean Kanteen Classic bottle. The bottle is made from 18/8, food-grade stainless steel that’s totally free of BPA and other toxins. Because stainless steel itself is safe, they don’t need to coat the inside of the bottle with a plastic or epoxy lining, which is one of the main differences between a stainless steel Klean Kanteen and aluminum bottles. Food-grade stainless steel is used in the brewing, food and winemaking industries too. It’s the material of choice because it doesn’t retain or impart flavors. The best water bottles on the market. We all have these bottles in our family. It was a little piece of my “mommy bag” and what we can’t live without. Share your thoughts and experience about “must have” items in your purse. Healthy Surprise Monthly Box. March 2014. Today would like to share with you my experience with my favorite monthly box subscription: Healthy Surprise. This is the best monthly subscription box for me so far. I wrote one review about them before, but it was my first time trying them, and after a few more boxes I can say they are the best in the market with monthly delivering healthy snacks and treats. 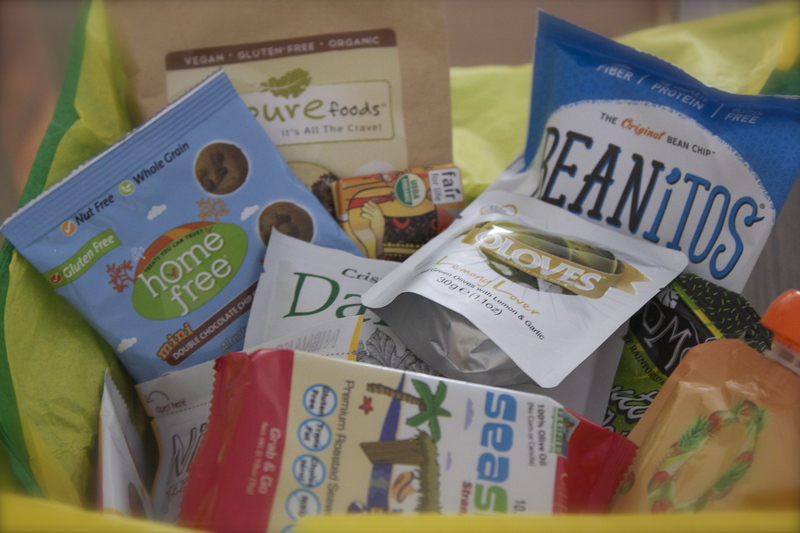 Healthy Surprise is a monthly service that delivers packages of vegan, gluten-free, all natural snacks directly to customers’ doors. Each month the boxes boast a different assortment of large and small, sweet and savory snacks – introducing customers to a variety of new products and brands. Products are thoroughly vetted to ensure their ingredients and business practices demonstrates a dedication to health, quality, and sustainability. Healthy Surprise is simple – choose from 3 box sizes. Snacks include dried fruits, nuts and trail mixes, bars, crackers, chocolates like dark coco espresso beans, kale chips and varieties changing each month. It never gets old. I am trying to avoid packaging food recently, but guess why I trust Healthy Surprise? THEY READ THE LABELS!!!!! 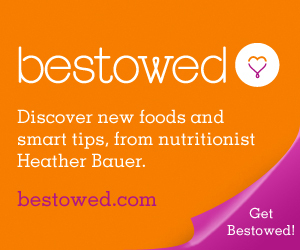 All their snacks are: gluten free, corn free, plant based, wheat free, gmos free, natural. I got my box at the beginning of March and we finished the snacks in 3 days, but I still want to write my review about them and maybe somebody will find new and healthy snacks for themselves. 1. Just Pure Foods Kalenola Chocolate. 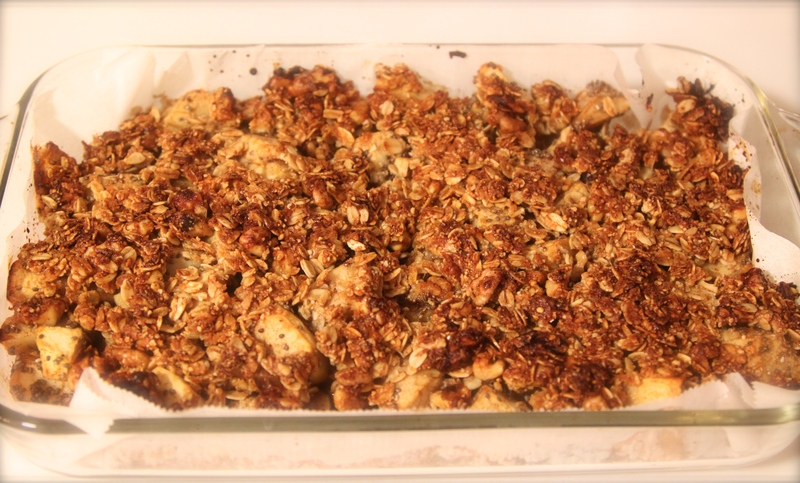 I would call it Kale Granola. Sounds crazy, but it actually tastes good. They recommend to serve it with nut milk, but I ate it as a snack. This is crunchy, delicious, healthy to go snack for me. 2.Samai Plantain Chipsin Pacific Seasalt. Let me be honest with you. I didn’t like these chips at all. They are great for somebody who really loves potato chips, but for me they were too oily and too salty. 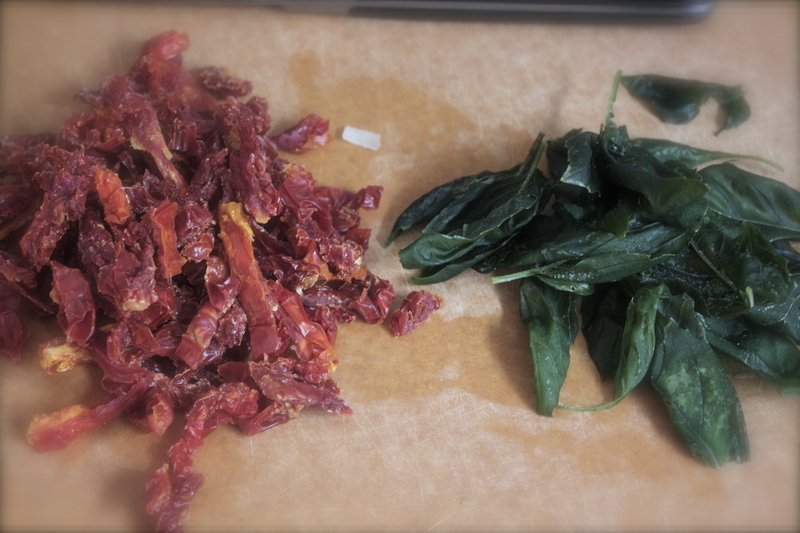 3.The Daily Crave Veggie Chips. We tried these chips before and they taste great. Delicious, natural dried fruit snack. Who doesn’t like dried fruit? I always use them as a candy for my daughter and she loves it. 5.Enjoy Life Seed and Fruit Mix. Delicious Trail Mix. Works great on the go, travelling or quick snack. I love “Enjoy Life”, because all their products are gluten, soy, GMOs free. I didn’t have a chance to try those, because Sophia finished them in no time( she loves almonds). But I prefer raw nuts, so I am not sure if I will buy these again. Delicious chips are made of beans. Great alternative to the regular potato chips. They taste great. 8.Danielle. Royal Sweet Potato Chips. I can live on those. These are the best healthy chips that I’ve ever tried. One of my favorite snacks. I tried a lot of flavors, but onion is my number 1. 10. Oloves. Pitted Green Olives with Lemon and Garlic. I don’t usually buy olives, but these were so delicious. I can’t find them in the store though. We didn’t try it yet, but we are going on vacation in a few weeks so will definetely take it with us. The only chocolate I buy because of the ingredients list: organic, no soy, no GMOs. 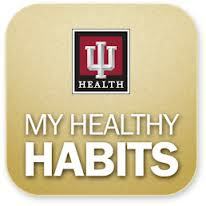 I also got 25$ Gift Card to shop with Healthy Surprise!!!! So this is a monthly subscription box with the option of 3 sizes. This was the smallest box labeled Starter Box that is meant to feed 1-2 people. All the snacks are full. The boxes are on the pricey side. This box goes for $40 (free USA shipping) and the largest box with 27+ full size snacks goes for $95 I guess the idea is to have all healthy snacks that are not so easy to get your hands on come right to your house so you pay a little for the convenience and variety. I think these would be a super gift to give pretty much anyone. I know if a friend send me a box of snacks I’d be super stoked. One more thing for Chocolate Lovers: Now you can order the monthly box full of natural, organic CHOCOLATE from Healthy Surprise. I can’t wait to try it!!!!! This post was sponsored by Healthy Surprise. Recently I found out that you can substitute dairy cream in your recipes, using soaked cashews. I did it before in my desserts, but never tried it in regular dishes, until I made Mushroom Stroganoff. This method is amazing, because it makes you dishes taste amazingly good and people still can’t believe they eat super delicious food with no animal products in it. Because of cold weather and laziness during these days, my easiest lunch is soup. It is always easy to make, everyone is full and happy after the big bowl of delicious winter soup, and also it gives me a little time for myself to do something besides cooking. The recipe I am going to share with you today is special. 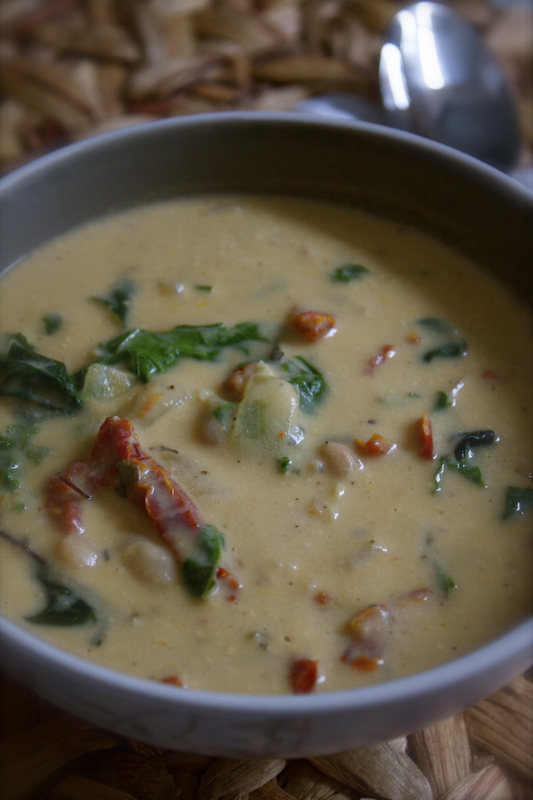 This soup is vegan, gluten-free, healthy and still taste delicious, and it’s CREAMY!!! Who doesn’t like creamy soups? I love them, but they are always full of heavy cream, fats and calories. BOO!!!! 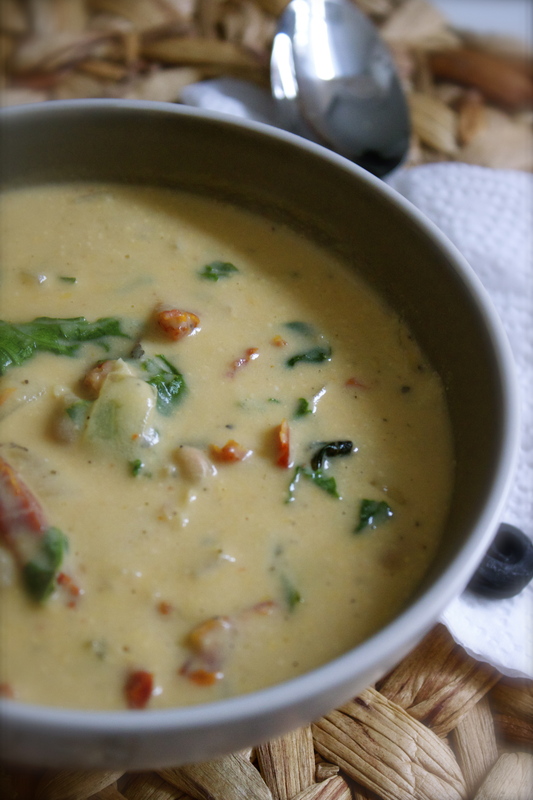 So this time you can make super delicious CREAMY SOUP, and enjoy it without any guilt, because it’s free of any bad ingredients for your health and body!!!! Soak cashews in water for 6-8 hours. Drain, rinse and set aside until ready to make the soup. Sauté onions and garlic with a little coconut oil. Add the basil, sage, salt, broth, beans, and tomatoes. Simmer, covered, for about 10-15 minutes. Meanwhile, combine the soaked cashews and water in a blender and blend until smooth. 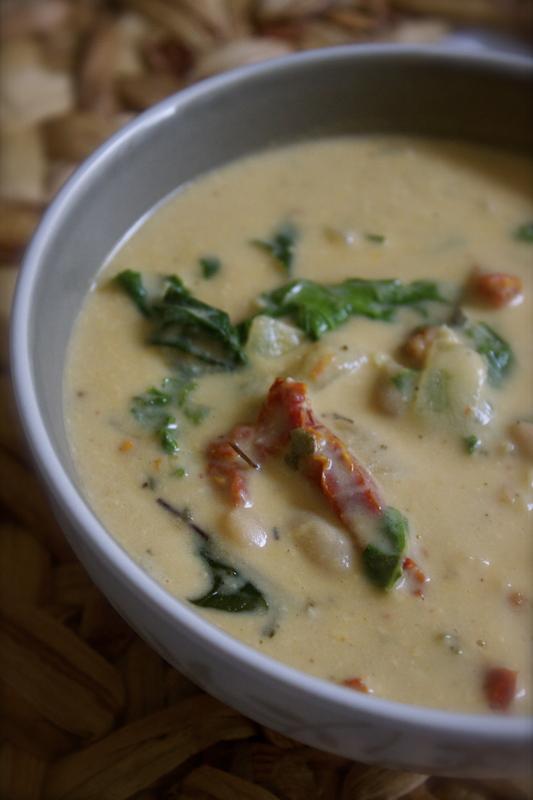 Add the cashew cream and kale to the soup and mix to combine. Cover and turn the heat off. Let it sit for about five minutes. Soup is ready to serve.